Epoxy encapsulants offer superior resistance to environmental hazards such as high temperatures and chemical exposure. Having the right potting compound is essential to rapid production, performance, and product durability. At ResinLab, we offer an array of standard potting epoxies and are skilled at creating custom formulated epoxies to meet precise needs. Our standard offerings include thermally conductive and flame retardant encapsulants. In addition, our epoxy encapsulants process easily and are friendly to the environment and the workplace. 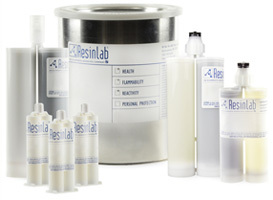 Contact an experienced representative for more information on ResinLab epoxy encapsulants or request a quote.